Before you head over to the nearest engagement ring jewelry store Liberty MO, you definitely need a ring size. You may need to get creative with this task if you plan on the proposal being a surprise. You may want to try her other rings on your pinky and take note of where that rests on your finger. You may need to enlist the help of her good friends. 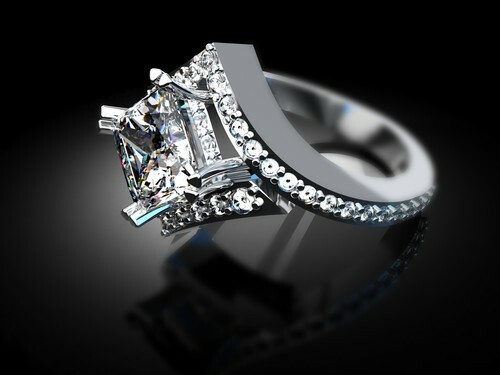 If all else fails, make an educated guess and the ring can always be resized after the proposal. If you two haven’t yet talked about this, then you need to be very detail oriented when deciding on the ring’s shape and cutting style. Since this is a ring that is going to be worn on a daily basis for many, many years to come, you may need to take into account everything from her type of work and daily lifestyle to help you decide on a ring that may stand up higher than others and possibly get caught on things. It’s also rather normal that you may be undecided about the diamond shape she may prefer, so in this case, it’s recommended that you stick to the classics, including square and round diamonds. Depending on the shape, it may pair better with other shapes when it comes to multi stone rings. Marquise, oval and round shapes work well when they sit side by side. However, if you go for heart or pear shapes, they’re going to be a bit harder to pair. Now when it comes to her preferences in shape, it can be reflected in various aspects. If she’s a bit more traditional, then she’s certainly going to love a round shaped diamond. However, if she has a more modern taste, rectangular or clean lines may be her style of if her tastes are more eclectic, marquise or triangular shaped precious stones may be her cup of tea. When it comes to the diamond’s cutting style, it refers to its facet arrangement. So if you opt for a round shaped diamond, it’s generally going to be cut in a brilliant style. This results in an arrangement of fifty seven to fifty eight facets that will reduce the appearance of inclusions and improve the precious stone’s sparkle. When deciding on a setting, you need to consider her lifestyle and how the setting is going to fit into it. For example a more secure, less ornate and overall lower profile is great for active people. But if she is more of a glamour girl, go for a setting with a unique motif, complex ring detailing and a stone with a high profile. The single stone is still one of the most popular choices in engagement rings. If it’s prong set, then the diamond is effectively secured by the head and thanks to the prongs, the precious stone can catch a lot of light. Compared to 4 prongs, a 6 prong setting is more secure, but it’s still not better than a bezel setting which can also protect the diamond’s girdle. Since engagement rings are meant to last a lifetime, they are usually made of platinum and gold which are both very durable metals that can easily withstand a lot of daily wear. When it comes to color, this is strictly a matter of personal preference, yet gold provides more options, including rose, yellow and white. However, the color of the precious metal is still very important, since it’s going to directly affect the diamond’s appearance. By considering these useful tips, you can have the peace of mind that you’re going to purchase a ring that will be cherished for a lifetime. Give us a call today at 816-781-4653 for answers to any questions you may have about our in stock items or a current order.